Santa Monica ’72 is a live album by David Bowie, recorded at Santa Monica Civic Auditorium on 20 October 1972 during the Ziggy Stardust tour. Taken from an FM radio broadcast, it was available only as a bootleg for more than 20 years; according to author David Buckley, possessing a copy was the test of a “proper Bowie fan”. The recording was issued officially by the Golden Years label in 1994, with Griffin Music handling the American release in 1995. This live album features a quite different setlist to the one found on Ziggy Stardust – The Motion Picture (1983), which was recorded nine months afterwards and similarly bootlegged prior to its belated official release. 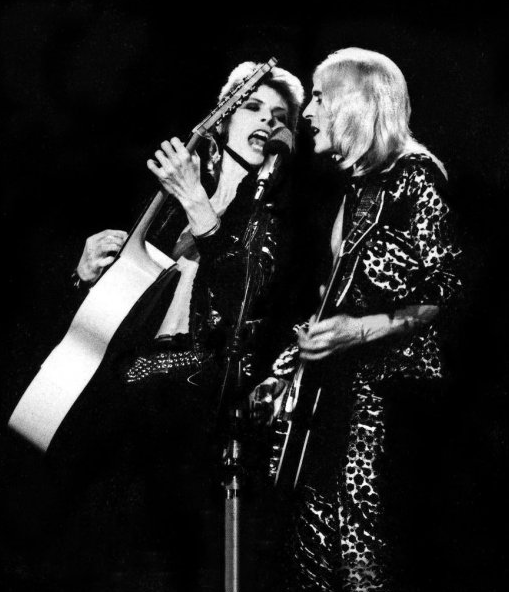 The Santa Monica recording is generally considered a superior representation of the Ziggy Stardust concerts in terms of both sound quality and standard of playing. In 1981, NME critics Roy Carr and Charles Shaar Murray called it not simply “the performer’s best ever bootleg”, but “far superior to either of Bowie’s official location recordings” to that date, David Live (1974) and Stage (1978). A gold disc edition with the DJ’s closing remarks at the end was made available in Holland, while in the U.S. a special limited box set was released that included a t-shirt, a key chain and a short video. The video was not actually from the Santa Monica show, but was previously unseen footage from a silent colour film made at a concert in Dunstable, England on 21 June 1972. The video was combined with the live audio recording from the Santa Monica concert. This box was limited to only 1000 copies. In addition, an even more limited edition was released as a small wooden box with Bowie’s image carved into the lid, and a brass plate indicating the series number. Only 250 copies were made. This semi-legal release was one in the series of mid-nineties releases by MainMan, Bowie’s former management company during the seventies (other ones being RarestOneBowie and the Ava Cherry & The Astronettes album People from Bad Homes). All these albums were released without Bowie’s approval and are currently deleted. An official version — Live Santa Monica ’72 — was issued by EMI/Virgin in 2008. 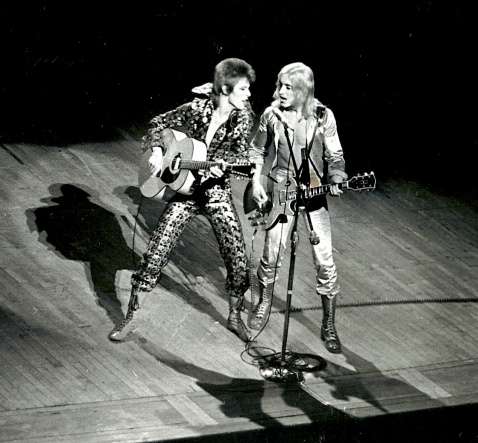 Among Bowie aficionados, the live recording from the Santa Monica Civic Center in 1972 ranks as perhaps the best document of the Spiders from Mars at their peak, certainly outranking the Ziggy Stardust: The Motion Picture soundtrack, which may have documented the band’s fabled final gig, but didn’t capture the band at full flight. This recording — frequently bootlegged, often popping up on semi-official releases, finally released officially by EMI in 2008 — does just that. Here, the Spiders sound otherworldly, lean yet monstrous, simple and lethal on “Hang on to Yourself” but majestic and dramatic on a ten-minute “The Width of a Circle,” flipping a hat to Jacques Brel via Scott Walker on “My Death,” then stripping down such grandiose Hunky Dory tunes as “Life on Mars?” to the essentials. The grand thing about Live in Santa Monica ’72 is that it doesn’t feel like a special gig: it may have been Bowie’s first American radio broadcast, but that’s secondary to how it feels like a snapshot of the band during its prime. It’s tantalizing to think that this is just how the band was in 1972 and that there may be plenty of other great performances never recorded. What’s special about this is that a night like this was indeed captured — and with each passing year this seems more and more like the best Bowie live album. Why this album was never officially released until now remains one of the great mysteries of major-label decision making. Long bootlegged, Live Santa Monica ’72 captures the glam-rock pioneer during his Ziggy Stardust prime,on his first U.S. tour, recording what is unequivocally his best concertalbum. With no needless production tricks to separate the music from thelive experience, everything, including the crowd, becomes part of thisintimate show taped at the Santa Monica Civic Center. Bowie is relaxed andchatty — he even introduces “Andy Warhol” with a goofy impersonation of thepop artist. His band, featuring the combustive guitar work of Mick Ronsonand tight rhythm section of bassist Trevor Bolder and drummer Mick “Woody”Woodmansey, was his strongest lineup ever, and here they run though nearlyall of The Rise and Fall of Ziggy Stardust and the Spiders from Mars,fleshing out the loose storyline about an alien rock star with appropriatecuts from earlier LPs, such as Hunky Dory‘s “Life on Mars” and Space Oddity‘s title song. Bowie also turns cover versions of the VelvetUnderground’s junkie anthem “Waiting for the Man” and Jacques Bruel’sbeautiful and harrowing “My Death” into fitting rock & roll hymns for Ziggy.It’s a near-flawless document of a character Bowie would soon leave behindfor good. It seems quaint now to think that illicitly taped shows were once the record industry’s greatest foe. These days bootlegs– particularly bootlegs like Bowie’s October 1972 gig in Santa Monica, which enjoy a degree of fan reputation– aren’t the enemy, they’re a blessed revenue stream. 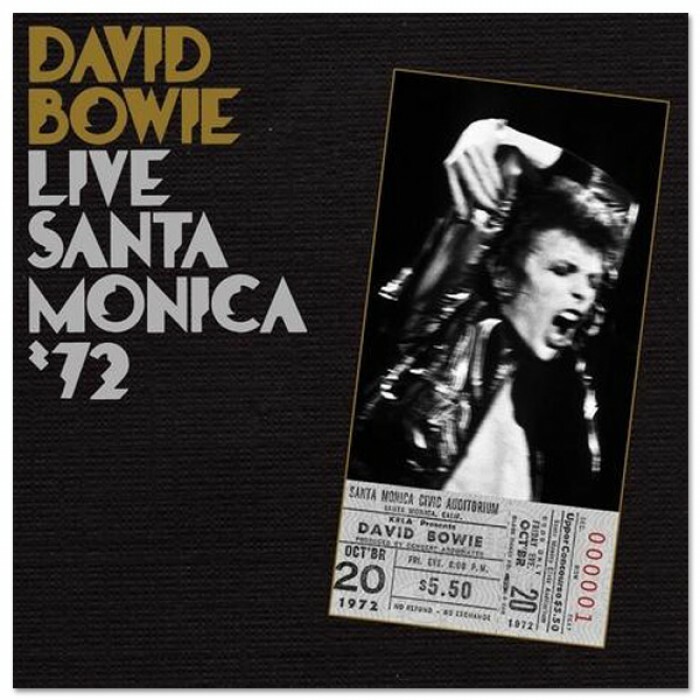 Santa Monica ’72 has had some level of official release before, but this version is repackaged and unlimited: An opportunity for casual fans to experience what is supposedly the best Bowie show on record. The obvious comparison for Santa Monica ’72 is Ziggy Stardust: The Motion Picture: same tour, but a very different document. That album is David Bowie returning to Britain as a conquering hero (and stunning his fans with his apparent retirement)– this one finds him far from home and still feeling his way into stardom. The Ziggy look and concept– the jumpsuit, the shock of red hair, the sci-fi glam rock– had kicked doors open for Bowie in England, but its impact in the USA hadn’t been quite so great. Santa Monica ’72 is the sound of a cult act pushing hard for breakout success.